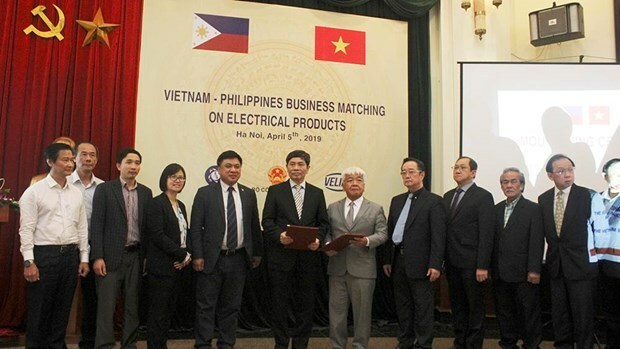 Hanoi (VNA) – Vietnamese firms introduced their capacity for producing machinery and electrical products to Philippine partners during a business networking event in Hanoi on April 5. Nguyen Phuc Nam, deputy head of the Asian-African market development development under the Ministry of Industry and Trade (MoIT), said the event offered a chance for businesses of the two countries to cooperate, contributing to boosting Vietnam’s exports to the Philippines. Over the past few years, bilateral trade has enjoyed notable strides, with revenue exceeding 4.7 billion USD in 2018, up 18 percent year-on-year, according to Le Hoang Tai, deputy head of the MoIT’s Department of Trade Promotion. The Philippines is Vietnam’s fifth largest trade partner in the Association of Southeast Asian Nations (ASEAN), after Thailand, Malaysia, Indonesia and Singapore. It has been seen as one of Vietnam’s most promising markets in recent years. Statistics show that Vietnam’s export turnover to the country reached 3.5 billion USD last year, up 22.2 percent against 2017. In the first two months of this year, Vietnam’s import-export value to the Philippines hit 803 million USD, a rise of 18.3 percent compared with the same period last year, of which export revenue was 587.3 million USD, up 19.17 percent year-on-year. Tai said that many Vietnamese products like coffee, seafood, garment-textiles, construction materials, and machinery and equipment, have gained a foothold in the Philippine market of 107 million people. He added that Vietnam holds huge potential for exports to the economy – which ranks fifth in ASEAN – especially in electrical equipment, power lines, and cables. Hero Yu, President of the Federation of Electrical and Electronics Suppliers and Manufacturers of the Philippines Inc. (PESA) and General Director of Yu Eng Kao Electrical Supply and Hardware Inc., said that the 12 PESA businesses participating in the event hope to seek suppliers of machinery and electrical products in Vietnam.